Calling itself a ‘lifestyle destination’ as opposed to a luxury resort, Kandima is one of the newest family-friendly gems in the Maldives. Kandima chose to do things a little differently, and they take pride in offering a fun, playful, and laid-back vibe with zero of the pretension or pomp that you may find in other resorts of the same calibre. Kandima oozes island charm, and comes filled with stylish decor, outrageously good restaurants, as well as wonderful service that will help to make your stay a memorable one. It’s a true idyllic haven set on a private island that’s fringed with swaying coconut palms and the shimmering waters of the Indian Ocean. Another bonus is that Kandima comes with very wallet-friendly rates. In fact, you’ll be pretty surprised to see how much a night costs per person, click here to discover the latest rates for a stay at Kandima Maldives. And read on to find out exactly why Kandima Maldives should be on your Maldives wish list. Kandima is located in the pristine Dhaalu Atoll, in an area that is home to some of the most diverse marine life in the Maldives. In order to get to Kandima, you will first need to fly into Velana International Airport which is located on the main island of Huhule. 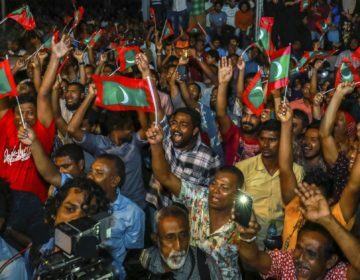 Over the past few years, flights to the Maldives have become increasingly affordable partly thanks to the introduction of many new low-cost carriers, as well as because many major airlines lowering the cost to keep up with the growing competition. 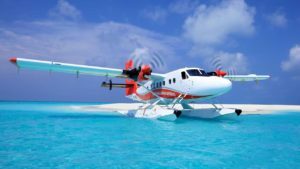 Once you’ve arrived at the International Airport, you’ll need to catch a seaplane for a 30-minute journey to a nearby Island. The seaplane ride is a wonderful experience, and it allow you to glimpse the stunning deserted islands from high above. Once you land at the neighbouring island, a speedboat will pick you up and take you on a 20-minute trip to get to Kandima Resort. If you send your international flight details on to the concierge at Kandima, they will be able to plan and book all of your transfers for you. Kandima has no less than nine different accommodation types to choose from, starting from just $160 per night! The Sky Studios are the most economical of the lot; these humble abodes are 55 square meters in size, and are able to accommodate a maximum of two adults and two children. The decor is simple and airy, and features bright accents to add to the tropical vibe of the room. The Sky Studios come with all the amenities you need to have a comfortable stay, including a fully stocked mini-bar, safety deposit box, adjustable air conditioning, bathrobes, soft slippers, flat screen TVs with huge selection of cable and satellite channels, as well as tea and coffee making facilities. The Sky Studios are actually located on the main beach, and you’ll have uninterrupted views of the soft golden sands and azure waters from your private terrace. If you love staying on the beach, but want something a little more luxurious and spacious, then we suggest you go for the beach villa with a jacuzzi. This private sanctuary is nearly double the size of the Sky Studio, at 97 square meters and it is also accommodates two adults and two children. The difference with this villa is that it comes with an large private decking area that’s just steps away from those sugary soft sands. If you dream of staying in a classic over the water villa, then go for the ocean pool villa. These villas are 90 square meters, and are located out on a jetty that hovers over the crystal waters of the lagoon. The ocean Villa comes with all the amenities found in the Beachside accommodation, plus a large private infinity pool that is beautifully positioned on your decking area. The outdoor space also comes with tables and chairs, so you can enjoy dining al fresco under the starlit sky. And for the creme de la creme, go for the Honeymoon Club pool Villa. This large Villa is able to accommodate two ago adults and covers 125 square meters. We love how these villas incorporate bright furnishings including sunshine yellow pillows and Maldives inspired artwork to really give a vibrant tropical feel to the space. This is also the most luxurious accommodation type of all of the options, and it features its own private infinity pool, as well as a sun terrace and private lounge area. Click here to check out more images of each of the room types, and discover the best rates on a stay at Kandima Maldives. Foodies are well catered for with no less than 10 bars and restaurants from which to choose from. There is a large variety of dishes and world cuisines on offer. If you fancy fun, fresh and light contemporary cuisine then head to Zest or Flavor for Market-style dining featuring special dishes of the day. For authentic Mediterranean flavors, check out Azure, while Sea Dragon and Forbidden Bar offer up Chinese and Asian-fusion dishes along with some of the best cocktails on the island. For a delicious and healthy breakfast check out Aroman, a quaint bakery and deli that serves up freshly squeezed juices, smoothies and delectable baked goods. Kandima also caters for those who enjoy an eclectic and vibrant night scene. Several of the bars feature live music, and international DJs who play toe-tapping beats and island grooves that are perfect for dancing the night away under the stars. A surprise is that Kandima also offers several destination dining experiences similar to those you’d find on some of the very best Maldives resorts around (think One and Only Reethi Rah), yet these are offered at a fraction of the price. If you like seafood, then you’ll love the lobster BBQ menu when can be served up on the beach, or on the terrace of your over water villa. There is also the Castaway bento box experience, where you can dine on a selection of Japanese favourites on a desert island. All of the different dining experiences and menus are available to view on their website. If you have any special dietary requirements, such as following a vegetarian, vegan or gluten-free diet, then simply let concierge know before you arrive and the chefs will be able to accommodate all of your dietary needs. The 10-treatment room EsKape spa is open to all guests over the age of 15, and it offers rather extensive menu of pampering treatments including natural facials, salt body body scrubs, deluxe massages, as well as packages for couples. The spa also has its own sauna and separate steam room, as well as a yoga studio. As soon as you arrive at Kandima Maldives you’ll be presented with a special brochure which explains all the different facilities and activities on during your stay. We love the Art Studio, which is unusually positioned on the edge of an emerald green natural lake. Here you can take workshops with both the resident artist, as well as with local traveling artists that come and visit and share their craft throughout the year. Dhoona Atoll is famous for being home to some of the most magnificent marine life in all of the Maldives. 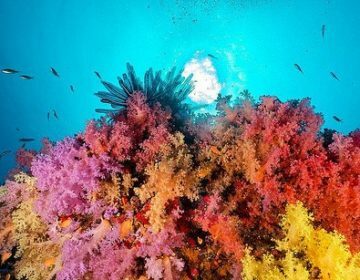 You can marvel at the vibrant underwater world by taking a scuba diving course with the knowledgeable Kandima scuba staff. 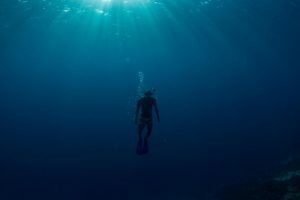 Other water-based activities include windsurfing, snorkeling outings, turtle quests, sunset dolphin trips, surfing, fishing, banana rides, topcat sailing, kite surfing, water skiing, and wake boarding…phew! And of course, there are plenty of activities available if you prefer to stay on dry land. Kandima have a number of fitness classes on offer including aerial yoga, Box Fit classes, TRX training, pound fit, balanced body, Kross Fit, Pilates as well as yoga classes. It also boasts the longest swimming pool in the Maldives! Children between the ages of 4 and 12 years old are welcomed in the Kandiland Kids club, Here, friendly Kandiland Krew are able to keep little ones entertained with a variety of fun classes. There is also a cinema room, creche, games room and large kids pool complete with slides and a pirate ship! An in-villa babysitting service is also available for children of all ages. Kandima are able to host honeymoons, weddings, as well as bachelorette and bachelor parties for both small and large groups. 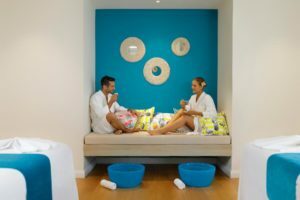 The EsKape Spa has a special package for honeymooners, so you can celebrate tying the knot with some real pampering time. Banish away the tension in your body with a soothing and mind-purifying treatment that helps to ‘purify, awaken and release the body’s inner fire, strengthen the nerves, and arouse clarity and joy’. If you are thinking about saying I do on the tropical island of kind then, Kamdima is able to accommodate all of your wedding needs. They have a whole team of professional wedding planners on hand to help organize your dream wedding in paradise, as well as your honeymoon if required. They also have photographers to capture those magical moments on your big day. You can view the full wedding brochure, as well as the price list on their website, and click here for the latest rates for a stay. Kandima is one of those places that you can go with both the whole family, or with a loved one on a romantic vacation away. It really does go above and beyond with it’s diverse array of activities, outings, restaurants, as well as classes and special events to keep even the most adventurous of travellers entertained during their stay. Because the resort is relatively new, everything is in beautiful condition. Take a look at any of the review sites, and you’ll see many past guests singing their praises for this tropical island resort. 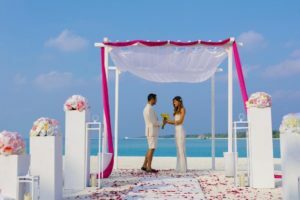 The icing on the cake has to be the incredibly affordable rates which are so much lower than many of the other Maldives Resorts within the same class. 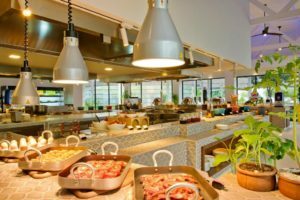 One potential downside is that the resort does not offer any all-inclusive packages, instead you must purchase all meals and drinks on top of your room rate. 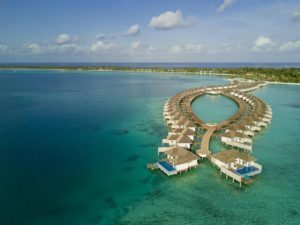 If you are looking for an all-inclusive getaway to the Maldives, then take a look at this article for some of our favourites. If you are thinking of booking your stay at Kandima, then click here for more photos, details and the very best deals on stay at this chic resort. 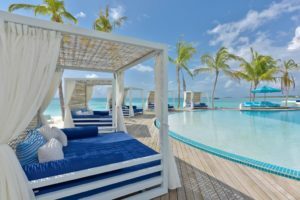 If you need a little extra help planning your Maldives vacation, then we have a number of detailed articles to help you with the process. 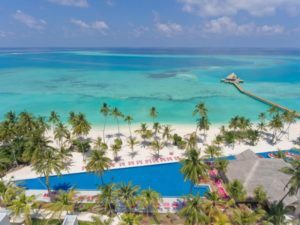 Check out this article for a month by month weather guide for the Maldives, as well as our ultimate packing guide so that nothing gets left behind. 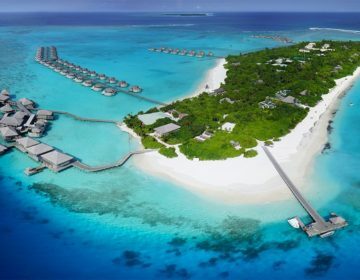 If you are booking a honeymoon to the Maldives and want some more Maldives accommodation options, then you may like this article which lists a few of our other honeymoon favourites. Have you stayed at Kandima Maldives before? What did you think? Share your thoughts in the comment section below.